It has been a little over a month now since I started blogging. It has been an amazing experience. I can't tell you how blessed I feel to be a part of this amazing blogging community. I am so grateful for how you have all treated me. I have felt like you have all welcomed me with open arms into your blogging community. It is funny how things happen. I think about how I came across Lori's blog (that I Love) 6 weeks ago, and because of Lori, I have discovered the world of blogging. Thank you Lori for giving me the confidence to start blogging. I wouldn't have ever done this if it hadn't been for YOU. Which by the way Lori has a great farmhouse stool giveaway, so be sure and check out her blog, Frugal Farmhouse Design for that! I can't believe the women I have had the opportunity to come into contact with because of blogging. You are the most talented and gracious group of women I have ever met. To think only a month ago I had no idea this even existed. I thought only people like Martha Stewart had blogs. I can't believe how many women are stay at home moms like me and have a blog. I have to admit sometimes it is a little intimidating to blog after visiting some of my favorite blogs. I am so amazed at so many of your talents. And do I wish I could take pictures like Mimi Charmante, (and have her kitchen) or write like Flower Patch Farmgirl (who also takes amazing photos & makes me laugh). Or there is this blog that I most recently discovered (thanks to Morning T) ...Lola B's, that got me in trouble with my husband because he thinks I am following Paul Walker's blog. This girl has such a fun and amazing blog! I would like to thank all of you for what you have done for me this past month! Blogging has been a life changing experience for me. You have all touched my heart. You truly do make me smile! So to thank you I would like to giveaway a set of spice jars from Anthropologie, to one of my lucky readers. All you have to do is leave me a comment letting me know that you want to be entered into the drawing (You don't have to have your own blog to enter). Also if you wouldn't mind sharing (if it has) how blogging has had an impact on your own life. Let me know if you are a follower and I will put your name in twice, and if you post about my giveaway I will put your name in the drawing again as well. I thought I would share another way to use these other than for spice jars. Yes, those are camellias, sorry. I did receive a lot of requests to use camellias again. 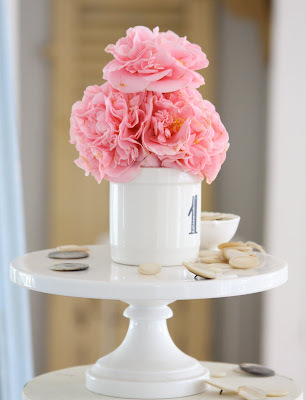 I think peonies would be a better choice, but they aren't in season. I can't wait for them to come into season. I am sure I will overuse those as well. 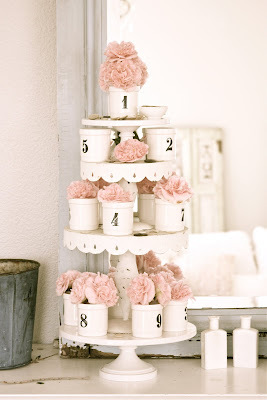 I think this would look great as a display at a wedding! The numbers on the spice jars that will be included in the giveaway are 0,1,2,3,4,5,6,7,8,9, there will be one of each! It is only the spice jars that are in the giveaway. There will be a total of 11 jars in the giveaway! Entries will close February 26th at 9:00 p.m. pacific standard time. I will announce the winner Saturday the 27th. I want to say THANK YOU to the most recent bloggers who have linked their readers to my blog, you are so kind! Thank you Federica from Sweet as a Candy. If you haven't been to her beautiful blog yet, you should check her blog out. She is from Italy and is the sweetest person (& beautiful). Not only do I love her blog, but I enjoy her friendship. Thank you Morning T, for sharing a link to my blog with your readers. Your blog is so much fun, and you are very talented. I have also found some great blogs (like ..Lola B's) through your blog! Thank You! Thank you Tina from Rubie's Place. Tina is from Australia and has such a cute house! I love Tina's kitchen redo. Tina is such a sweet person! She has a fun blog and is very talented! I also want to say THANK YOU to Anne Reagan from the Apartment Therapy for including a link to my blog on one of your posts! I feel so honored! I just checked my email before publishing this, and was quite surprised and excited to see an email from Anne Reagan! Thanks Anne you have really made my weekend! To be honest I can't believe you read my blog! I am really honored!!!!!! I hope you all have a great weekend! I hope you have a chance to check out all these inspiring blogs. You won't be sorry you took the time to do so! I know that I get so excited when I find a new inspiring blog and I don't want YOU to miss out! Everything that is highlighted in pink will take you somewhere fabulous and fun! Don't forget to leave a comment if you want to be included on the giveaway drawing, and also if you wouldn't mind sharing how blogging has impacted your life! I would love to hear your story! 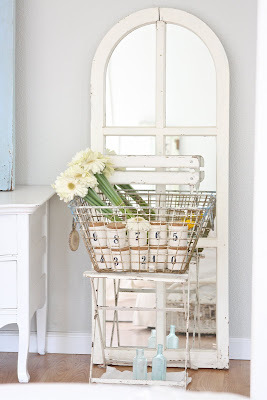 Don't forget to check out Lori's giveaway, (Frugal Farmhouse Design giveaway)! Please take a minute to visit Chania from Razmataz. She has a new blog also, and is an interior designer. She was nice enough to want to do an interview with me. You can find a little more about me & Chania if you head over for a visit. Thanks Chania! I'm a new bloggee too and I am thoroughly enjoying it! Takes a bit of time, which unfortunately I don't have a lot of at the moment but I am enjoy following everyone but my blog roll is getting rather long! In blog speak 'I am liking yours'. Keep it going and keep enjoying. Maria, I'd love to be included in your competition, even if I have to pay for the jars to be shipped here to NZ. Your blog is very sweet - keep up the good work. Oh that would be so wonderful to win these sweet spice jars! I'm a follower for sure. My hubby doesn't get blogging but that's ok. I love it! You have just taken blog land by storm! Love your blog. Happy day to you. Pick me please! You are such a sweetheart, what a wonderful giveaway idea! I've been following you for a while now, and love your photographs. Thanks for the blog links, I'll be sure to check them out! I'd love to be put in the drawing for those spice jars....loving me some anthropologie! I am a follower and I am doing a post today linking to your give away! Oh, almost forgot...I'm about 3 weeks into blogging...loving it so far...I homeschool our kiddos so it's been a great creative outlet for me! You have a beautiful blog and a beautiful heart! 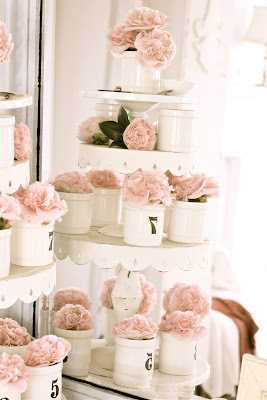 I love those jars - just lovely! I want to win, I love these. The blog world has opened up a new world for me and given me beautiful new friendships. Thank you so much for sharing your talents! Pleae enter me into the drawing. I look forward to further inspirations. I too would love to have the set of spice jars. I went to the Anthropologie site after your first post about them, and they are sold out of several numbers. I am a follower, and I have your blog on my blogroll. I have only been blogging for a few weeks, to journal and document the moving-in and redo's of our new house on the water. We have much to do! I have learned so much from all of the beautiful blogs out there, including yours. I am amazed at how talented bloggers are, and how generous in sharing for decorating and enjoying life. I'm posting about your giveaway today too. What a great giveaway, the photos are gorgeous. I'm a follower for sure Maria. Before I started blogging I was pretty lonely after having moved city/country every couple of years due to hubby's work. Making friends was becoming a bit of a chore but once I started blogging it was just too easy! I feel like I have friends all over the globe! LOVE your blog. I am considering writing one, but I am admittedly a chicken. Bwak. Bwak. You've got to have some courage to throw stuff out there every day. Oh and I would love those spice jars! I am new to blogging too. It's been almost two months for me. I am a follower of yours and have your blog listed as one of the blogs I follow on my blogroll. Your blog is amazing. Love the spice jars; especially number 3! (You can find out why on my blog). Hi Maria, I would love to be entered in your draw to win those fabulous jars. I am already a follower, and will mention your giveaway on Monday when I post my interview with you. Blogging has given me a little community of people I have contact with. Since I work for myself, my blog friends are my coffee break pals. First of all, I have been drooling over these adorable spice jars from Anthro....drooling! So many possibilities! I started blogging almost a year ago because there are so many ideas out there (design, crafting, art, etc.) and wanted to share some of my ideas when they cross my path. Your design inspires me. A daily inspiration is the best part of blogging! Thank you so very much for your giveaway! I LOVE those spice jars! I bought a few random ones b/c my local store didn't have all of them when I stopped by. I'd love to have a full set to use in my home. Thanks for the great ideas on how to use them!! I love your blog and love your home! I look forward to seeing all of your ideas each day! Truly! I started blogging as a way to keep connected and up to date with a bunch of my local friends. We all have kids and sometimes we just can't seem to get together. Blogging was a way for us to stay connected and up to date on our families. It has become so much more than that now. I have actually made connections and real friendships w/ people thousands of miles away. The community is incredible. I bought my first dSLR camera last year and now my blog also serves as a way to showcase my work and my passion. When I receive a friendly comment it just completely makes my day. I'm sure you have discovered the same thing! It really is a great feeling to know that someone cares about what I am writing or photographing. As a stay at home mom who often finds herself stuck at home with children 24/7 its great to know that I can connect with other women who are doing the same thing that I am. Thanks again for the giveaway and for have a beautiful blog that I enjoy reading and getting inspiration from. Have a wonderful weekend!! I'm keeping my fingers crossed! Came over to meet you from Between You and Me...so glad I did! I would love to be in your giveaway. I just started to follow your blog that is beautiful. I have been blogging for three years in the end of this month. I live in America but I'm from Sweden so I started blogging to show my family and friends picture of what we were doing to the house and then pictures of our daughter. I wright in Swedish so It keeps me close to my language. I have met so many people in my country with the same passion for interior decorating and the color white. However I would like to connect with American bloggers with the same intrest and have been thinkig about starting a blog in English. There you have my blog storie. By the way what a beautiful wedding your sister had!!! Wonderful! From a Swedish women living in Vermont. What a wonderful and generous giveaway....and I'm so pleased that we have now got an Anthropologie here in London!! The way that I started blogging was, I was looking for a picture of a Gustavian room and googled it. I clicked on an image and it took me to Ness's blog, Marley and Lockyer. I see that you have her on your sidebar so, you know how inspiring she is. Well, at the top of the page it said, create a blog and, that was it. I'm amazed that I was able to do it !! I think that the best thing that I have got from blogging are the friends that I've made from all over the world. ...and the inspiration and, everyone is so ready to help you with decorating questions etc. I have found the most wonderful shops and have spent a fortune on things !! especially from Scandanavian countries. I do blog, but it's a family journal type blog. I love blogging. Hi Maria, What a great giveaway! I have been following your blog since I saw your pictures on Lori's website. Blogging has definitely impacted my life. I just had a baby and we live in a city where we don't know many people yet and don't have any family close by, so blogs have connected me with other women and taught me that with some creativity it is possible to have a home I love on a tiny budget. I don't have a blog yet and have never won anything on a blog but I would really love to win these jars! I would loan them to my cousin for her upcoming wedding and I would also use them on display in my hutch to hold small things and look beautiful. Maria, your photography is beautiful! i love browsing your blog. I've been following ever since I saw you featured on My Sweet Savannah. I have been blogging off and on for a few years now. It is a great escape! Thank you for offering such inspiring ideas.. and for the Fabulous giveaway!!! okay missy??? whats the deal here? you have over 500 followers and I have 39? Yikes! :) I really like your blog, and have been doing it seriously since june of 09, I too am amazed well, not amazed because I have always known that people are wonderful, especially women. Kindred spirits, that understand what its like to be a woman. The greatness of being a woman. Okay, now I know why you have over 500 people, its that cute cowboy husband of yours. :) BTW, I am in the process of turning my cherry furniture into shabby chic, so those jars would be delightful, couple that with the fact that I have only won one thing in my life and I follow your blog certainly should make me a contender. It's introduced me to new friends, new ideas and inspiration galore. hey i would hang around here if you never gave away a thing! just love what you have to share...your style is fresh, comfortable, family friendly and light-filled...and the competition doesn't hurt, right? i love following your blog! blogging has given me a different view of life, both through the eye of the camera and getting peeks into other folk's world. I'm a follower and such a fan. I'd love to win these jars. Your blog is great and I'm so amazed at the number of followers you've gathered in such an incredibly short time. That should let you know how special your blog is! I started blogging as a way to let out some of the creative energy that is always rolling around in my brain. Blogging helps keep me focused, stops me from feeling creatively frustrated, and it allows me to make blog friends! It's great! What an awesome giveaway!!! I love your blog and wish my house could look like yours! :) I'm also a follower! Can't wait to see who the lucky winner is! Blogging has affected my life in so many ways. I started waaay back in 2004 and never looked back. Currently I write about local history in Bucks County, PA, where I live and grew up. It's interesting to look back and examine the transition from "20-something's diary" kind of blogging into blogging for more than just myself. It makes me feel like more of a grown-up! Again, another beautiful post and photos. I Am a follower and love your blog. I have a blog too and love doing it. I've came into contact with some talented gals. Just need to find the time to blog more! Have a wonderful day. Just wanted to say hello - I enjoy your blog & find your pictures & posts very inspiring!! Welcome to the blogging world!! These jars are so cute - I'd love to win! i've learned so much from reading other people's blogs... including yours! my own is just a record of my family's days- nothing fancy, but it sure is fun! thank you for hosting such a fun giveaway! Hi Maria! 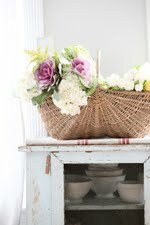 My heart actually started beating faster the day I found your beautiful blog-no joke-your home is gorgeous! I just started NookNo4 about 10 days ago and have since become a follower of yours. I see you are one of mine also-thank you so much! I just love the anthro jars! Thanks for doing this and I look forward to reading your blog! I enjoy your blog. I wind down after a lday at work by reading your blog and getting ideas of how to re-purpose things around the house. I too love those jars and was sad when I could not get a complete set because some of the numbers were sold out. Thanks for a chance at your giveaway. wow. what a wonderfull blogg!! I've been coveting these spice jars ever since you posted about them and am SO disappointed that there is no Anthropologie anywhere near where I live. So if you ask me, a perfect choice for a giveaway - I have the perfect place for them in my kitchen, Maria! Wow Maria~ What a giveaway! Please throw my name in the hat and YES I am already one of your followers and I will post about it on my blog today. You have certainly taken the blog-o-sphere by storm with your incredible pictures of your home and your gracious nature (visiting those who visit you). I just started my blog in May of last year and and it has totally taken over my life. Finding a new blog (like yours) that inspires and resonates with you in so many ways is like finding a long lost BF or soul sister. I just had lunch yesterday with an incredible lady that I met through my blog. My blog has inspired me to become more open with people (I'm typically pretty reserved and shy) and keeps me going on my house projects which I love! Thanks for offering such a fabulous giveaway! By the time I got to Anthro online last week (after reading your post) they didn't have the whole set so I didn't even bother. Hi Maria, Love your blog! Your posts are lovely and you have been so creative in your own home, it is an inspiration! Last night my daughter and I made the MS pompoms for her room and some smaller ones that we made into napkin rings for my Mom. They are so cool and we had a blast doing it. I am a writer and can honestly say that I love blogging! Even though I write on organic beauty products, I always come back to home design;) I'll try to post about your giveaway this weekend and send link when up. Thanks! you've only been blogging for a month? wow! nice job! my sister & i have been talking about a startup - huge work. thanks for the inspiration & boy oh boy do i hope i win!!! happy saturday! What a wonderful post and a wonderful giveaway! Your blog is such a great addition to the blogging world! I am a new blogger too and like you it has opened up a whole new world for me. I've already met so many wonderful people and have been given such great support by some wonderful veteran bloggers! It has given me the chance to share the things I love with people from all over the world and then they in turn share their loves with me! The amount of talent, creativity, and genuinely helpful people I have found through blogging makes me feel like I've made all sorts of great new friends already! It truly has been an amazing experience for me! First off, I have to say I can't believe you've only been blogging for a month!! Look at you! You are a pro. I love blogging, and like you, almost can't remember what my life was like before it. It is my passion now. I never knew such creativity existed within me. Only through blogging. I am already a happy follower! P.S. be sure to come over and enter my Blogaversary Giveaway!! Thank you so much for sharing your home, talents and ideas with all of us. Your home is an inspiration and you take beautiful photos. I have been blogging for just about a year now. I have a couple favorite design blogs, and now yours is one of the few that I follow on my reader (I think i found you through holly's mention from life in the fun lane). Blogging has changed my life. I stay at home with my two small children and it truly is a complete creative outlet for me. I have started painting furniture and have been inspired to become more brave with incorporating white into my home. I love reading your blog and seeing your beautifully inspiring home. Thanks again for taking the time to share. Welcome to the blogging world! I've been blogging for about 9 months. I feel it has given me new inspiration for my home, new activities to do with my kids (I have 5 too! ), and fun, new ways to meet people. I would love to be included in your drawing! AND I am a follower! and what a giveaway!! Fantastic! Welcome to the blogging world! I've been blogging nearly a year and a half and I find it very rewarding, and as you have noticed, the women you meet are so wonderful! What a great giveaway you are sponsoring. I look forward to reading your blog and seeing your nice ideas!! Yep, I'm a follower and will be putting a post about you on my blog...handstowork.typepad.com. Loved your sister's wedding pictures, your kids are adorable and wow, your husband is a hotty! these are some of the most beautiful photos! I would love to set those spice jars up in the locker basket just as you displayed them! It's beautiful! You have such a knack for beauty! Just found your blog - beautiful. Loved the photos of your sister's wedding. My daughter was married in June. So many similarities - lace bridal gown (champagne - she's a redhead! ), black bridesmaid dresses. But she used green hydrangeas for her flowers and all accents were shades of green. She made the all the bouquets and centerpieces, but used silk because we didn't want to be up all night before the wedding. The guests thought they were fresh. Thank you for entering me in the giveaway. I am trying to get up the courage to paint everything in my house white. Your house is so peaceful and serene. I am a follower and fan of your blog. You have a beautiful home. As a military family we have friends and family everywhere. Blogging has given us a great way to keep in touch with them. What a compliment coming from you! I have so enjoyed finding you as well and am inspired constantly by your blog! Congratulations on your beautiful blog! I am a follower! I love your blog for so many reasons, but honestly I come most often because the pictures truely allow me to feel completely relaxed! Its like stress relief in a photo! :)I find that to be true in the "at home with white" book also. Anyway, I started blogging on my 30th birthday, longing for change and a fresh outlook on life. I was definitely not where I had pictured myself being at 30. Once I blogged just pretty much randomly for a few months I stumbled across a photography blog. Just like that my passion for photography that had laid dormant since highschool was suddenly REBORN! Later that week my husband bought me my first DSLR and I went crazy reading everything I could get my hands on. Photographing anyone who would stand still or any inanimate object that tickled my fancy! I didn't really blog much after that but used my blog as a launch pad to read other blogs and started looking for specific elements on blogs. Eventually I let that first blog go and started Jamie Thompson PhotoBlog. I still use my blog as a jumping board to get easily to my favorite blogs, but now I love to blog about whats new in my world. If I hadn't decided to start a blog 4 1/2 years ago who knows where I'd be or what exactly I'd be doing. A lot has changed in my world in those 4 years. The 2 greatest things? I became a mommy and I found my passion. Check out my blog I will post a link there back here! But even more so? Thank you for the reminder of how one simple decision can change your life in a heartbeat! Reminders are always nice! Yes, I want for new posts from you everyday. While you've just been doing this a short time, you have quickly become one of my favorites. Your home is lovely. We moved to Texas after 26 years in Arizona. Blogging has been a great way to make new friends and give me a break from my "job". I would so love to have those wonderful little spice jars...maybe I will get lucky! I think what I love the most about blogging is that for a stay-at-home-mom, it's my way to still feel connected to the outside world :) It's like I'm still me....as much as I love so much being Momma, I still need to feel like me. Does that make sense? I would love to win these spice jars. Love Anthropologie! I, too, am relatively new to the blogging world. In fact, I just set up my google reader a couple of weeks ago, and am now as my husband puts it "OBSESSED!" I follow your blog and love all of your photographs. I think that you are doing an amazing job!! I am contemplating taking the plunge into the blogging world, but have not been brave enough as of yet. Very cool. I started blogging over 3 years ago and it opened up a whole new world. You mean there are others out there that are like me? What a great feeling. I am stuck up here in north ontario canada and this is my lifeline! What a wonderful giveaway! I think blogging has changed my life by helping me to focus my creativity. While I was pregnant and after my little guy was born, I didn't DO that much creative stuff and it truly is my passion. I adore your blog and am so happy that yours has grown so very quickly. I am waiting for YOUR book on decorating. Wow! Congrats on such a successful start to your blog! It is beautiful! I read about you from Morning T and had to stop by! What a sweet giveaway! I am a stay at home mom as well, and love to be inspired by creative moms, such as yourself. You have a real eye for design. I love dropping in to see what you've come up with next. I was resistant to blog reading for awhile, thinking it took up too much time...but now I'm hooked. It's that fun little part of my day when my kids are not tugging at my legs (or maybe sometimes they still are!). I would love to be entered in your giveaway - I've had my eye on those spice jars for some time now! I love their simplicity. I have been blogging for several years, and it's impacted me most by what it's revealed about myself. What an awesome giveaway. After you posted about these jars I went and was only able to order 4..so I did my anniversary of 0709...well, then I got an email saying they only shipped two..so now I have 0 and 9 only arriving .....hmmm...so to win a full set. I am a follower and I will post a link today on my blog Ciao Bella!!! First of all, ANY of your photos are magazine worthy! You have a great sense of style and a great eye and it all looks very professional. I don't have a blog, but visiting different design blogs has really filled the void that was left when so many different magazines went under. It's given me lots of ideas for my own home, and inspired me to stretch a little and try things I didn't think I could pull off. I live in a very rural town, and the things I like are not found here. "Slipcovered furniture?? Huh? Swedish oldstyle? What is that?" Everytime I would mention something like that to anyone, I'd get such a look of confusion. And I'd LOVE a full set of spice jars. I hopped on to Anthropologies site as soon as I read your post last week, but all they had left were #8 and #9. Bummer. I completely agree with you on this one! I've always thought that only celebs blog until I stumbled across a sweet little blog, became a loyal reader and was inspired to start my own blog a little over a month ago. And I feel like I've met so many wonderful friends in this little world. It's amazing!! 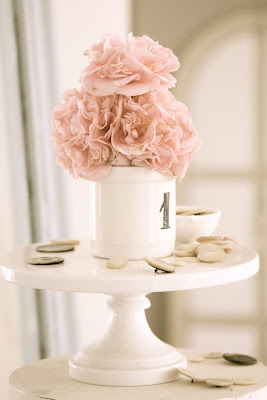 I've been following your blog now for a little while and absolutely love your photos and decor ideas. Beautiful! I have a passion for whites as well:). I would love to be on the list for the Anthro jars- one of my most favorite stores:). Thank you for giving me a daily dose of beauty!! Your home is beautiful and you do take lovely pictures! I am a follower and would LOVE to have the spice jars. What a generous giveaway! I am new to blogging too, about a month now. My close family and friends don't share some of my same passions. So it's really wonderful to find all of these creative people. You have a lovely home and blog. Blogging is so inspiring and I love to make new friends. I'm a follower!! What a yummy giveaway! Love the spice jars! I love blogging, my grown children make fun of me cause I love blogging so much. I love all the comments other bloggers leave on my blog and I love seeing what others are doing with their houses! I am so thankful google gave us the use of blogging for free!! Thank you google! I have met so many friends through blogging, some I would have never known! Heck, I got in my truck and took off to Iowa one time just to meet another blogger! Now we have a wonderful friendship! And off course everyone knows my love of white! I was doing white long before it ever got hot! So calming! I would love to win a set of spice jars. I actually went to the anthro website and tried to purchase and they were no longer avail. I stumbled upon your blog from another's, I think lulu. I love reading and blogs almost every day. They have given me so many decorating, entertaining and recipes. Please enter me...And thanks for your "outside the box" suggestions for displaying them! I'm a follower! And I've been eyeing these jars for quite some time. We're a military family, so it's always a fun experience trying to make my accessories work in different houses, every few years. I'm envious of how settled you are, and your ability to truly make a house feel like a home. Your home is beautiful and I am a follower. I look forward to reading posts from other bloggers whenever I get a free moment. I'm also a stay at home mom and it is great to read about other bloggers family life and to be inspired by there lovely homes. I often find new ideas and end up rearanging and decorating daily. Thank you for all of your beautiful ideas! 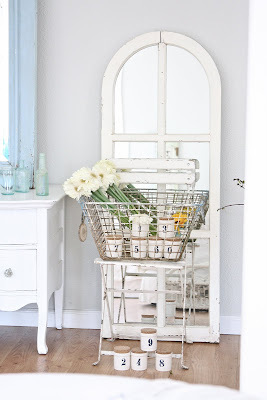 I just love your blog and you've definitely won me over to the white decorating style. I'm going to do a new nursery in whites and grays for our latest little one. Thanks for the inspiration! I can't believe your blog is such a young blog - it's gorgeous! It makes me think maybe, maybe I could do it too. You are already doing a give away? Fun! The spice jars are adorable and your photos of them are inspiring. Thank YOU for making it so easy to enjoy your blog. :) I've been blogging for about a year now, but just off and on, just to keep in touch with far away friends. Then one day I got a new follower and I'm sure you can understand how excited I was that a complete stranger would want to follow my blog. Since then I've enjoyed blogging more frequently. These "strangers" really do turn into friends and it still amazes me how I look forward to reading their blogs each day. It also pushes me to delve deeper into my creative spirit and I love that! I'm very new to your blog, but each of your posts holds new magic and inspiration. I look forward to many more visits and thank you for sharing. PS I'm a follower and I did post about you on my blog! It sure is easy to see why you're so popular! You're taleneted, sweet, and so humble, we can't help but love you. I am (happy to be) a follower as well. And cannot wait to share your blog through my own. Any of my (very few :/ ) readers who haven't already been lucky enough to find your blog sure will be glad I've shared it with them. I started blogging after being inspired by my best girlfriend to do so, and now, it's a never ending form of inpsiration for me in making my home what we love and always provides a smile from my lovely readers. So glad you are loving it too! I have been following since day one and love your beautiful blog. I am always inspired thank you!! I would love these spice jars for my pantry. I love blogging because it allows a snapshot of what I like at the moment. It also helps me to keep track of the things that I love and want to remember. HI, I just found your blog and have added you to my netnewswire! I love your blog! Congrats on taking the plunge. I have made a couple of posts on my blog but have a lot to learn as you say. I love blogging b/c I found people out in the world that love what I love - crafts and decorating!!! Very few of my in the flesh friends have the same interests as I do. I love them dearly but for different reasons. Have fun with your blog! Congratulations on your blogging anniversary. I'm a follower and I'm so glad you joined all of us and WOW!!! What a wonderful giveaway!!! When I started blogging I just wanted to share some decorating and tablescaping ideas with likeminded individuals but blogging has exposed me to so many wonderful people I'd never met otherwise and it's incredible the talent and great individuals that are out there making up this community. I made some wonderful friends along the line. Please count me in for your great giveaway, I'd love to win. Ok I can't figure out where on your blog to subscribe to posts. I found the subscribe to comments but not posts!! Help!!!!! Oh these jars. They just kill me. Anthropologie doesn't exist anywhere near me, so I totally found out about these jars too late. Dangit! Sure would love to own them! And count me in as a follower. Your blog pretty instantly shot up to the very top of my "must stalk" list... I'm totally hooked! As for how blogging has impacted me... mostly reading blogs just makes me crave and crave and want and want and covet and covet. So many things I simply adore/must-have/can't-stop-thinking-about! But beyond that, discovering all of these amazing blogs has really helped me find my own style. It's like I *thought* I knew what I liked, but then seeing pictures and ideas and plans from total strangers suddenly made my creative mind jumpstart. I just love that! Found your blog thru Sweet AS A Candy, and am now a follower! Absolutely love your blog! 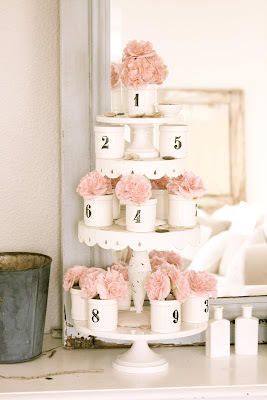 Gorgeous pictures and love how you put things together! Would love to win your giveaway! Beautiful blogs like yours have become an addiction for me! they are so inspiring. I am going to go post about your blog on mine right now and then come back for some more inspiration! Thanks! Great blog! Love all the whites...it is so up my alley. Thank you for the opportunity to win the spice jars Antho is so rude to be out of stock of. Reading blogs helped me through our infertility. Once we had our son, they helped me decorate and really turn our house into a home. When it was time to try for baby number two - again with the infertility treatments - pretty blogs and hopeful stories helped get me through the medical stuff. Now I'm 23w pregnant and I wouldn't be here without the help of "strangers" on the internet. Your photos are so beautiful! Love them! I am a follower and am always excited when you have a new post. Beautiful! Those spice jars are so fun. Thank you for the chance to win! What a great giveaway~as these jars are no longer available through the website and I want them so badly :( Blogging has opened a whole new world for me, so much inspiration, it's amazing. My blog is far from being as awesome as all the fabulous blogs out there, but none the less I find it relaxing and a time to get away and wind down when reading blogs and blogging myself. Blogging has enriched my family life. I find so much inspiration through beautiful pictures, craft ideas, recipes and advice. I just wanted to add, I just posted about you on my blog and I'm so very thrilled to share you with my readers. I'd love for you to stop by some time and take a look. ;) I've not been blogging very much lately but I'm making time in my hectic little life to get back to it so I'd love to have you as a reader. :) Have a lovely weekend! I would love to be blessed with these jars-they would give me great joy! I am more of a lurker-blogger; I learn so much and have gotten and implemented so many ideas! You have a beautiful home and a graceful way of writing. Kudos to you for making such a warm and welcoming home away from home on the big wide web.I started following your blog as soon as I was directed to it. I wish I could remember who it was that posted about you so I could give her due credit. When it comes to photos, you my dear have nothing to worry about. Your home and the photos of it are extremely complete and beautiful, whether you take them all or not. I feel such charm when I visit your blog. You bring white to life! Love, Love ,Love your blog! Welcome to this intriguing world of life-changing communication! P.S. Love the Anthropology spice jars!!!! Hello, I have to say your photos and blog is just as nice as others if not better.You are very humbled and I think some forget how to be grateful! I myself have met some amazing women and they don't all have a home redo or a great decor to be amazing. Just be hapPy being U! my blogging and my family's blogging has helped me keep in touch when a phone call would be impossible (2 loud kids here). it has helped me reconnect with family/friends. and it has helped me vent about life. Love these spice jars! 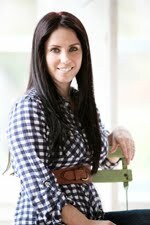 I am a new follower of your blog and want to thank you for sharing your beautiful home and inspirational ideas! I have been admiring these jars since the first time I saw them in Anthropologie!! I absolutely love them & can think of several ways to have so much fun with them. I enjoy being a follower of yours & others who have wonderful pictures & great ideas for so many of us who enjoy fun home decor & striving to stay within our budgets! Thanks for the great give-away & great pictures of the jars! Hi there, Im Jenny I own a little shop called City.Cottage and have started a blog ~http://simplecasualliving.blogspot.com/. IT IS A WONDERFUL thing to find woman pasionate about the same things! Please stop by my blog and say hi if you ever have a chance! off to blog about Dreamy whites! I'm so excited, please enter me! I am a follower (huge fan) and I posted on my blog about the giveaway. I can't even tell you how much I have enjoyed becoming a blogger, it's the first thing I fo every morning and the last thing at night. Finding blogs like this one is just one of the great rewards. Being a wife and stay-at-home mother is rewarding work, but doesn't do much for the "creative" side of me. I love that blogging helps me to express that. Thanks for these beautiful pictures and a great giveaway. Good luck to all. I'm so glad "Between You and Me" led me over to your blog. It's really wonderful. I'm adding you to my bloggy subscriptions. Thank you for the opportunity to win those jars. They are great. I love your blog and your lovely home. I'm a blog follower and would love the Anthro. spice jars!! I have never in my 2 1/2 years of blogging seen a blog take off like yours....WOW! You should be smiling and what a great giveaway, I would love to be entered as I am a follower of yours also. First let me say that you have a gorgeous blog! I love your style of decor. Blogging has been a wonderful outlet for me. I have always loved to decorate my little home and I seldom have known women who understand my passion for it. Since joining the blog world I have met many women who understand it and me perfectly. That has meant a lot to me. I have met sweet women from around the world, Belgium, France, Netherlands, Australia, just to name a few. I live in Canada and we don't have a lot of decor stores here. We are a little behind, I'm afraid. I truly feel like I have made some real friends, I just haven't met them face to face, yet. But our hearts have spoken to each other. Thank you for a chance to enter your giveaway. I love Anthropology's merchandise and I would so enjoy having these spice jars. I blogged a post about you today, with great pleasure, I love to introduce new blogs to my friends. and your simplistic attitude... this is why I blog for relaxation and beauty that others share from their home that inspires us all regrdless of how many followers they have it is the heartfelt love and sincerity that draws me to a blog and well of course the BEAUTY of their style too. I hope you have a great weekend. FYI I POSTED ABOUT THIS ON MY BLOG AND I HAVE BEEN A FOLLOWER FROM THE FIRST DAY. This is so great b/c I actually went to Anthropolgie to order these jars and they were sold out :( :( I would love to be entered for a chance to win the set! I also want to share a little of how blogging has been so special to me. The first blog I discovered was the Farm chicks, so I obviously was addicted immediately. I loved browsing through her favorite blogs and shortly after decided to start a blog of my own. I find it very therapeutic to keep this what I think of as a journal of my life and my favorite things. I also live 4 1/2 hours from my family and it has given them an opportunity to feel as if they know more about my life and what I do. It is so nice to receive inspiration from others and possibly be inspiring to some, although I have had my blog since like July and am sad to say I only have 13 followers. I guess I just dont know how to get my blog out there! Any suggestions?? PS Thanks for the give-away! Oh and I am a follower!! I forgot to write this in my previous comment. oops! What a wonderful new blog to enjoy. I have shared your blog with a dear friend who lives in a doublewide. We live many hours apart but do a little each time we are together. I live and own a house that when we originally were house hunting I refused to even go in and look at. I am now working it into a house that would be comfortable and inviting home for anyone. It is all in your creativity and attitude. Thanks so much for the inspiration and congratulations on your successes. I'm enjoying your blog, and I'm now a follower. I'm loving the giveaway, the photos you have with the flowers are so pretty! I love those spice jars! I went onto anthro's website to buy some and they were sold out! lol. I am a recent follower of your blog...Love your style! I decorate with a lot of white too and love the simplicity of it. Blogging has opened me up to a whole different way of looking at design because of all the talented women that I have been learning from on here. There are so many things that we all have in common and its great to meet so many great people! Thanks so much! What a neat giveaway! Glad you're enjoying blogging so much. I have met some very nice women and have learned so much from them! *thank you* for such an amazing giveaway and the constant inspiration!! I have to thank you for letting me know the other day that these were on sale. I did hop over and buy ONE. They were almost all sold out. I would LOVE to win the whole collection. I love how you have displayed these. You are very talented. ;) So glad you've joined us in blog world. Dear Maria, I love your sweet white blog and your fabulous pictures...and your family is wonderful! Dear Maria, it is a pleasure to come and visit your Blog. As a passionate for white, old furniture, we sure have lots in common, like many others. I just purchase these jars at Athro and they sure are lovely. Coincidentely, I got for the 1.95 each. What a bargain, hey? I love your blog. I love your style. I love those spice jars. I have been thinking of doing a blog -- for about two years now. I have been reading your blog since your first entry. I can't remember how I found it but I follow in my Google reader. It is such a peaceful place to visit. I love the give away...Keep blogging. Count me in! I love what you have done with those adorable spice jars. So creative and so fun!!! I've got you linked on my blogroll and i'm a faithful follower, always excited to see what you'll do next! Be sure to enter my giveaway too!! Your home is beautiful! I am a follower and would love to enter your giveaway. I started blogging one year ago and I am so happy I found all these great people who share their homes, ideas and inspiration. Your home and your blog is such an inspiration! I'm new to blogging but have been following them for quite some time. I love the new people you meet, people like yourself; with a husband, kids and I love to see their real life living. After growing up on a farm in the midwest and my husband used to manage ranches, I love to see how others can make it all work in their home...I love the inspiration and can't wait to get more of my home out there for others to see, maybe some day being an inspiration for someone else. I would love to enter this drawing! I love your blog-pure eye candy. Blogging changed my life because it connects me to other women. I can gaze at gorgeous decor anytime and lose myself to blog surfing until I don't know where I started-one big daydream! hi, I just found your blog, I cannot believe you have only been blogging for 6 weeks, looks like you are an old pro!!! everything is just gorgeous and you have sooooo many followers, congratulations to you!!! please enter me, I know just what to use the beauties for, I am off to check out all your past posts. What a fantastic giveaway, I just had to try. Thanks for the chance to win! I have a blog, but am not much of a blogger, but I am grateful for all those who diligently blog their creativeness! I have benefitted so much from reading blogs like yours for ideas. I lack the "gene" you possess so I am glad I can check in daily and get inspired. Thank you! You do not have to enter me in the giveaway since i already cleaned out my anthro of those little jars. Keep up the lovely work here. I don't have my own blog because what's most fun for me is following all of you wonderful women each day. Thanks for the amazing inspiration! I'm loving your blog and am so glad you started. By the way, I'd LOVE to win these darling jars! I love your blog and I've been a follower from the first post! You have inspired me to begin making slipcovers for my furniture. I will be posting about them when the project is finished and I will link to your blog:) I'll let you know when I do that. So glad you started blogging. I would say blogging has impacted my life w/ new friends, inspiration, and also has helped me figure out what I really like in decor and to be more free with what I like. A little over a year ago I didn't even know what a blog was. Now I am so excied and passionate about my blog. I love blogging. It is a way I can express myself creativly. With a baby I can't sit and scrapbook anymore, but I can fit blogging into my life. I also LOVE being inspired by all the other amazing bloggers out there (like you). I have made some great friends too. It's been a wonderful experience. I am a follower of your gorgeous blog! I enjoy your blog immensely. I haven't taken the leap into my own blog yet, but I used to have a retail home decor shop that I had to close when my husband took a job in another state and following the design blogs sort of keeps me in touch with fellow decorators since closing the store. I would love to win the jars!!! Hello, I would love to be a part of your give away. How exciting! Your blog is beautiful! I am a follower of yours. Can you share your secret? I would love to be entered in your generous give away! I've been blogging for seven years and in that time have made some wonderful friends; some who I've even been able to meet in person! Where do i begin... your giveaway is as sweet and amazing as YOU... blogging has turned into another creative outlet for me... i didn't realize how much I love journaling my story and I love reading the stories of everyone i connect with... i feel like it's been such a blessing. wishing you many many many posts!!! I so wanted a set of those spice jars! I've always loved to write, so blogging was a way for me to be a bit creative while sharing about our lives with far-away friends and relatives. I am so inspired by the blogs I read daily - all these women (like you!) are boosting my creativity! I started my blog just a week or so before you started yours...and I have been sooo so blessed. I'm so thankful to have met so many beautiful women like you who are following my little blog, and I am following yours as well. Thank you for your sweet comments on mine. I'm a busy mom of 4 kids, with a dh who works too many hours. Blogging has become a way to express myself, share little moments in our home, and connect with others. Typically I feel so isolated and alone and uninspired during the dark days of Winter. Not this year. I am blessed beyond measure to "meet" so many other kindred spirits. Wishing you many more posts of happy blogging Maria! I moved for the very first time away from my home town 2 years ago and blogging came to my rescue! November we moved and the snow came and winter blues with it. I started with Rate My Space as we bought this big old house that needs so much TLC. Friends that I met there started blogging so I started one too. It will never be big and fancy but it is a wonderful way to connect with people and enjoy all the creative juices that flow in blog land!! Oh - these are beautiful! I ADORE your blog. I just started blogging recently too. What a fab giveaway!! 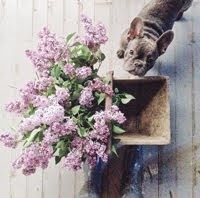 Just found your blog via Ciaobella! Anthropologie is my favorite..love love your blog!! I love reading your blog, Maria! You know what? I'm looking for antique shutters now. I guess I am more of a blog READER at this point, but I am so inspired by what so many do. The talent out there is amazing! I would love to have my name in the hat for the jars. Thanks for offering these to your readers. Oh boy what a fabulous giveaway - pick me, pick me !!!! I love your blog and read blogs for inspiration. From your blog I was inspired to start on my bedroom to turn it into a dreamy white oasis. I absolutely love your blog and the pictures you post. It is very inspiring. I am a stay at home mom enrolled in school full time getting my masters to better the lives of my kids. This blog is a little piece of "me time" I enjoy daily. Oh, and I LOVE the jars!! Dear Maria, you are talented!!! :) Thanks to dear Federica from Sweet as a Candy, because of her now I'm following you from another part of the world. I'm also very happy to be the part of an amazing world of bloggers. And lets say once again -Maria "YOU ARE TALENTED!" I don't have a blog, but following others just makes me feel connected to a huge group of incredibly talented group of women. I feel inspired and connected, and gets me to do something creative! This is a wonderful blog to visit and a very generous giveaway! what a wonderful giveaway! please enter me! love your blog and the pictures of your home! beautiful! I love your blog, so dreamy. Great giveaway! 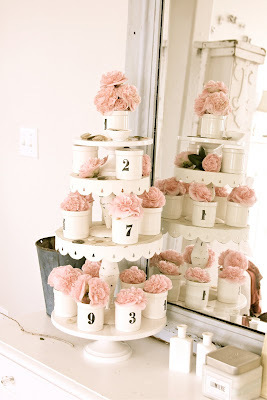 I love the jars with the pink flowers in them!! So sweet! I just discovered your blog and I am a follower!!! Crossing my fingers to win! Hi I am new to the blogging world also. I love it and only wish I could devote all my time to it. I wrote a DIY decorating book back in the 90's and I have found it is what I am best at. Having a blog is letting me be my own Editor in Chief. No one can tell me what is right, except me. I am going to a Blog conference next weekend and hopefully can learn lots. I just found a young blogger who is a stylist for Anthropologie. Her blogs name is Junko, but the url is different. 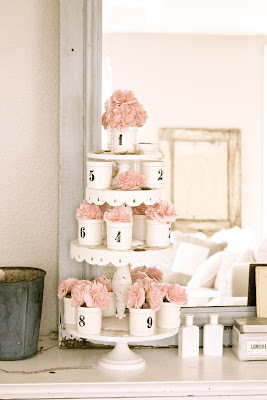 She is collecting all sorts of white items to use in her wedding and these jars were in the photo. I would love to win them. I have become a follower. I love your blog..I blog also as a way to connect with other like minded women who love to create and hang with their families. Hi Maria. Your blog is beautiful You have found such a creative outlet. Blogging has had a big impact on me. After a friend told me about her favorite blog, I became addicted to them. One thing led to another (I wrote about this in my first blog post about a month ago). Now I have a small booth in an antique mall and just started my own blog. I also have a new interest in photography. Your photos are beautiful. If you wouldn't mind giving some advice, which is more valuable to a beginner ~ a great camera or photoshop? I love photos that are crisp in the front and blurred in the background. Congratulations on your success. Your blog is gorgeous. It is amazing how fast you have grown! But no surprise...your rooms are so beautiful...I am always so excited to see a new post! I love the blogging community as well. I feel like I have a whole bunch of new friends! It's wonderful! Come by sometime! i just love your home, so beautiful! i too just started blogging and i just became one of your followers. it's just amazing how many of us have this passion for decorating, especially with "white". great giveaway! Congratulations Maria on an excellent blog. I've never seen anything like this after one month of time blogging. Wow! Your network is incredible, your layout is fabulous and the photos are excellent and enticing as well. Congrats on your fabulous following already and hold on for what is in store for you in 2010. I know it will be fabulous. I just found your blog through the gal that got you started blogging and found out about her through JMS (Junk Market Style) site. I am not a follower of your blog as well. Your family is beautiful and your story is inspirational. So glad you dove into the blogging world. I am a jewelry designer by trade, and started blogging Jan. of 2009 to share some of my design style, journey and product. I was inspired by Elizabeth Maxson's generous blog back when she was still a proprieter of her shop. Another of my inspirations is Sara at "A Beach Cottage" in Australia. I feel my life is so much richer from blogging this past year and I wish I had blogging back when I was a young Mom. It is such a blessing to be a part of the blogging world. Off to see more of your lovely blog. Wow what a wonderful giveaway...just found your blog thru Shelia Payne's "Tatered Goods" and wanted to congratulate you on a wonderful start of a blog. I've been blogging for over two years and I'm envious of your followers already...great job! I'm a follower as well and have added you to my google reader. You're such a sweetheart to have this giveaway!! I can't quite remember how I found your blog but I sure thank God every day that I did. Your blog is up there as one of my favs. Here's to many more happy postings and a great giveaway! Love your style. Your pom poms rock. Thanks for sharing the instructions. I made some as well for my daughters room. Soo cute. I've been reading your blog for a few weeks and I LOVE the whites. I've been blogging for a few years now but haven't got to in the last year. And I miss it so much. I like to share my thoughts, ideas, interests, projects, and inspirations with others and even vent a little too :) so I would love to be intered in your givaway. I'm a follower and i posted about your blog and yout givaway with all my blogger and facebook friends. wow maria, what a generous gift!!! I would love to be in on the giveaway! What an awesome give away...I was heartbroken last week when I ordered these only to get an email from Anthropologie the next day to say they were out of stock. I was so sad. I don't blog myself, but am a blogstalker and am so happy to have found your blog. You truly have amazing style. Maria, I do follow your blog and would love to be entered (twice!) in your giveaway! *love* those spice jars! I have really enjoyed your decorating inspiration as well. I blog as well and have found many new friends that way too~ I *love* being able to stay home to care for my family and also interact with other like minded women. In addition, blogging has helped me articulate that which is really important to me and rejoice in all the ways I am blessed! I would love the chance to win these beautiful jars. I am also a follower and a big fan of your style. Look at the impact you've had on this little world of blogging. Ok, not so little ... Your talent, your eye, your heart has captivated OH SO MANY (myself included!)!!! I look forward to your blog posts, and its like getting a personalized piece of mail when I read your posts. It is like I'm getting a special glimpse into your heart, your home. A giveaway is just too much! You have given so much to us already, and I just can't believe you're giving MORE. But I know how you feel. Blogging is more than a hobby. More than telling 'the world' about your life. It is an amazing fraternity of women. Talented, non competitive amazingly supportive women. Women who know just what to say, who have been there before, and who constantly encourage us to be the BEST us we can be. Sigh....it is a piece of heaven. Winner or not of these jars, I truly feel I'm a winner for being one of your first few followers to your fabulous blog. I do hope to meet you soon!! xoxo - Tracy. Love your blog! I have a cake blog, but get tons of inspiration and stress-relief from reading blogs. Keep the posts coming! I love these jars. What a great gift. I am a follower and LOVE following you. I am a new blogger as well. I have only been doing this for a few months. I agree that it is great fun and great ladies.